Brigadier-General M.A.J. 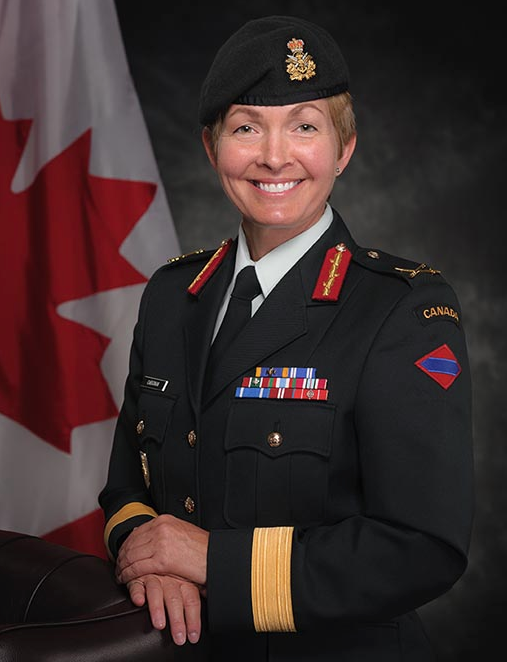 (Jennie) Carignan, Chief of Army Operations of the Canadian Army in a formal portrait on July 18, 2016 in Ottawa, Ontario. Photo: Corporal Mélani Girard, Canadian Forces Support Unit (Ottawa). ©2016 DND/MDN Canada. Ottawa, Ontario — The Canadian Army (CA)’s Chief of Staff for Operations, Brigadier-General M.A.J. (Jennie) Carignan, says senior officers must always be open to ideas from the ranks in order to ensure the organization is as innovative as it can be. BGen Carignan offered this and other insights during her opening address at a conference on the subject of Innovation Methodologies for Defence Challenges, held in Ottawa from January 30 to February 1. Featuring a wide range of speakers from both military and academic circles, the event was organized by the Centre for National Security Studies (part of the Canadian Forces College), Royal Military College Saint-Jean, and the University of Ottawa’s Centre for International Policy Studies. The higher ranks are often viewed as the main source of knowledge and new ideas may get shut down when they come from lower ranks, she added. While noting the battlefield may not always be the place for such discussions, BGen Carignan urged leaders to find the time for them. BGen Carignan joined the CA in 1986 and commissioned into the Canadian Military Engineers in 1990. “I am your typical engineer. I am very much attracted to science because it provides me answers,” she said. Despite that certainty, she explained, many of her planning and tactical tasks were a substantial challenge and she often felt disappointed in the results. In search of answers, BGen Carignan took on post-graduate studies 10 years into her career. Those studies included areas of the humanities such as history and philosophy, which offered a fresh perspective. That, she said, “freed my mind” and “tore down walls” she’d built in her own mind, allowing her to see the CA more in terms of people than organizational structure.